The call for proposals will close on 30 October 2018. Our upcoming 15th European Ecological Federation (EEF) Congress, Ecology across borders: Embedding Ecology in Sustainable Development Goals, is to be held in Lisbon, Portugal, 29th July – 2nd August 2019. This congress results from a joining organisation of EEF and Portuguese Ecological Society (SPECO). This 15th EEF Congress aims to present the most advanced achievements of ecological research and the burgeoning issues of ecologists, discussing inter-, intra- and trans-disciplinarily their impacts on the present problems societies face. Using the officially called “Major Groups” of United Nations, the conference intend to extend discussions based on ecologically relevant interfaces to tackle the sustainable development goals and help to create a more sustainable biosphere and a more equitable society. Past EEF congresses have attracted hundreds of participants, and this year we aim to convene ~700+ active researchers eager to present and discuss their research findings with agro-ecosystem managers, nature conservation agencies, marine and coastal services, as well as different stakeholders and policy-makers,. Interested in a particular topic within the conference scope you wish to discuss/develop further? Send us a proposal for a symposium! The idea is that anyone with a keen interest in ecological research, regardless of presenting a poster or oral communication or not, can organize a symposium. Proposals addressing the conference theme, “Embedding Ecology in Sustainable Development Goals”, and any interesting subject relating to Ecology are very welcome, especially if creating interdisciplinary connections with other scientific or non-scientific areas (e.g. : social development, medicine, economy, agriculture…). Please note that: Your symposium should provide a well-integrated synthesis of a given topic. Each symposium will have a total duration of 60 min. The structure of your symposium must be: Roundtable/Discussion with one major communication OR Short Presentations with discussion. We have a limited number of vacancies. »» Title of each speaker (’s) contribution to your symposium. Even if it is not the final title, please include an indicative title for each speaker. 15th EEF congress, Lisbon 2019. Biological soil crusts #BSC have a negative effect on seedling growth under full-watering conditions but positive under water stress conditions. 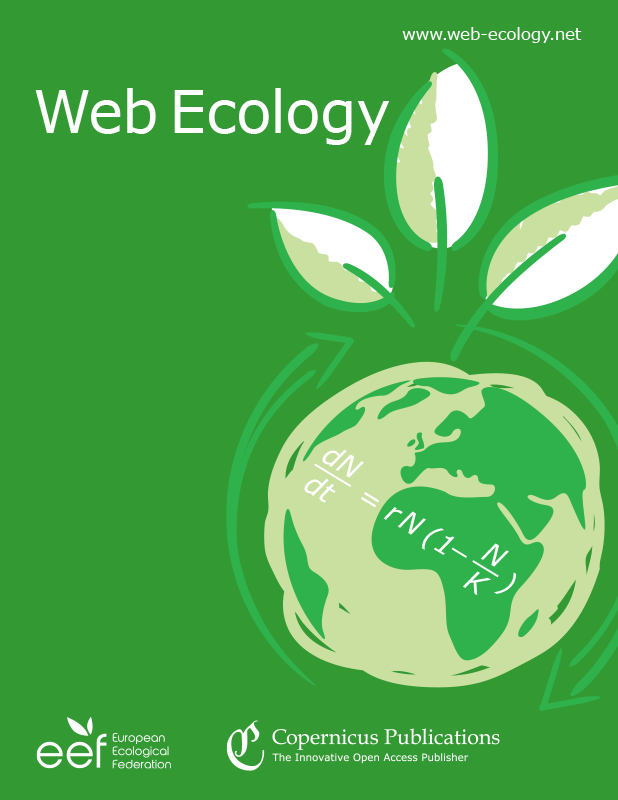 Web Ecology is an open access peer-reviewed electronic journal. Please visit the Web Ecology website to read articles free of charge.